The event in the Swane café in Wuppertal was one more example of liberals giving the fascist AFD a platform to spread their racist views in Germany. Antifascists protested loud and clear in the hipster location before the event started. The event was cancelled due to the protests, so the AFD wasn’t able to spread their racist views on Thursday night. After the succesful interference of antifascists in Wuppertal, it became clear how much fascist parties are accepted by so-called liberals in the German city. An “independent” (Supported by the German Green party) candidate for the upcoming state elections in Nordrhein-Westphalia, Jörg Heynkes, posted on Facebook: “Fascism is when a smaller group demands they be allowed to decide whom is allowed to talk in our city”. His Facebook posting worked out well for Heynkes, the candidate for state parliament in Nordrhein-Westphalia appeared on all of the major media stations. With his posting, the liberal candidate actually stated that in his opinion, fascism is when people act to prevent other people from opnely spreading racist and inhuman views. Heynkes also published a picture on Facebook with the faces of antifascists during the protest. Pictures like these are often used by German fascists to threaten, injure or kill antifascists. Image: Antifascists protesting in Café Swane in Wuppertal, on March 2, 2017. The aftermath of the protests show how liberals like Heynkes fight for the “right” to give racists a platform to spread their views, and to fight directly against people who protest against the spreading of racist views. The hysterical reactions after the protests against the event in Café Swane show that many people think its normal and “democratic” to discuss racist and archaic views. This is not about a violent action against members of a fascist party or people who give these fascists a platform. There was no “blockade full of hate”. Some of the people in Café Swane stated loud and clear that they didn’t want to hear the racist viéws of the AFD, somebody read a poem and others where standing round in the Luisen street. The event was cancelled because a big part of the audience just didn’t want to hold a discussion with racists. That’s the real story about what happened. It was alarming that there were also people who thought it normal in a democracy to discuss things with people who intend to destroy democracy using false reports and a shift in debates by establishing terms like “transethnization” (which actually means ethnic clansing), “ethnic traitors” or “overforeignisation”. When discussions with the fascist AFD become normal, like they are already in many German talkshows on prime-time TV, and during events like the one which was planned in Café Swane – the fascists become part of the “normal” political debate. Far right race-baiting led to 527 violent attacks (a statistic of the federal German government) against refugees in Germany last year, and therefore discussions at eye level (like Café Swane wrote in their invitation) with racists can not be tolerated. Race-baiting isn’t an opinion or a discussion with an open outcome. Antifascist groups vow to continue to fight against the acceptance of racists having a platform to spread their abhorrent views. On Saturday, Mach 4, 700 riot cops protected a march of 70 fascists in the Barmen district in Wuppertal. The German fascist party “Die Rechte” called for the march. About 400 people joined the antifascist counter protests against the march. According to local police one person was arrested after he allegedly punched a nazi during the counter protests. Image: Counter protesters against a march of the German fascist party “Die Rechte” in Wuppertal on Saturday. 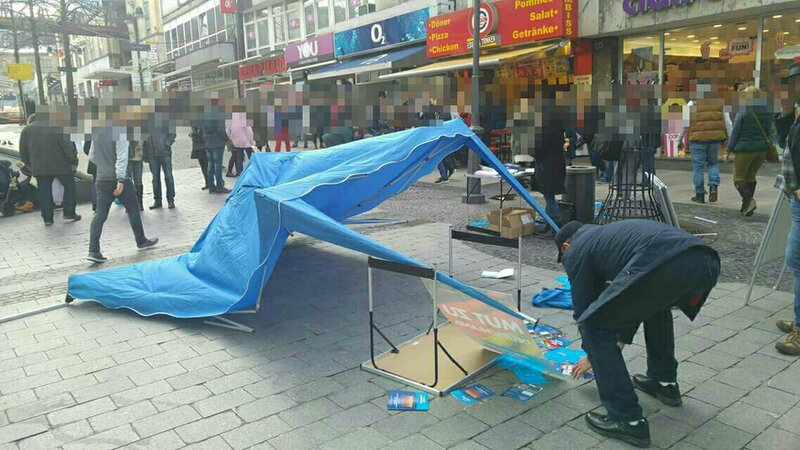 While riot cops where busy with protecting the fascist march in the Barmen district, antifascists attacked an election campaign stand of the fascist AFD party in the Elberfeld district in Wuppertal. 18.03.2017 #Leipzig, #Germany: They Shall Not Pass! – #Connewitz | Enough is Enough!